In addition to all conference sessions, seminars, and activities, Ridgecrest provides onsite food and housing accommodations. You are free to either participate in these arrangements or make your own plans. 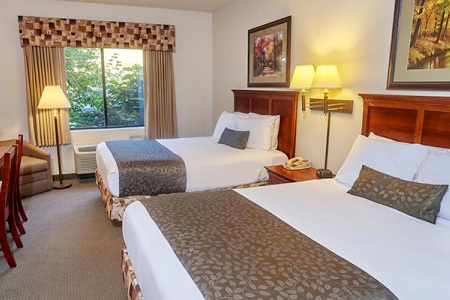 You can arrange your room and meals through Ridgecrest Conference Center by calling 1 (800) 588-7222. Mention that you are part of the Faithwalkers group. If your church has a housing coordinator, please reserve your room and meals through them. If your church does not have a housing coordinator, you can arrange your room and meals through Ridgecrest Conference Center by calling 1 (800) 588-7222. Mention that you are part of the Faithwalkers group. A list of housing coordinators will be available in August 2019. You can choose from four types of rooms at Ridgecrest: standard, deluxe, family bunk house, and youth bunk house. Click here for a map of Ridgecrest's campus to see where each housing facility is located. The meal plans are for December 28–30 only. The Full option includes three meals each day (breakfast, lunch, and dinner) while the Portion option includes only two meals each day (lunch and dinner). If you'd rather provide your own food, you don't have to buy a meal plan. There are several restaurants and grocery stores in the nearby Black Mountain area. Please note that you will not be allowed into the Ridgecrest dining hall without a meal pass. Have a question about housing or meals? Something else? Contact us and we'll help you out.